Is there a working SACD iso player for Ubuntu? So here is the thing ... I used to listen to a huge collection of SACD iso files on Windows. Many albums are released as SACDs for the audiophiles around the World. Imho 90% of these SACD albums are mastered far, far better than the original CDs. This is the whole reason behind the SACDs. The reason I listen to them on my PC using a DAC (with native DSD support) is that these SACDs are extremely expensive. I have a friend in Russia who sends me ISO files of these SACDs. 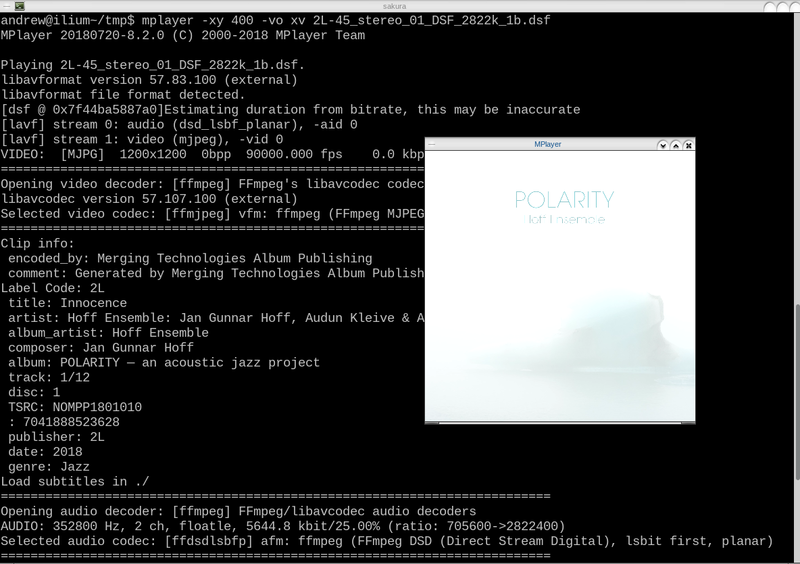 On Windows I can use Foobar2000 with some plugins with ease. On Ubuntu I see no alternatives. Is there a way to listen to these SACD iso files on Ubuntu ? I would prefer not to convert the DSD content to flac. I would like to use the native DSD capabilities of my Denon DA-300. Audio players found in the repositories (VLC, Totem amongst others), do not play DSD natively. dsd is supported, sorta. you need to use ffmpeg plugin, linked with the system version of ffmpeg, which has DSD support compiled. then all you need is to include the needed file extension to the list of ffmpeg plugin's file ext list. MPD has a SACD plugin. But the DSD files must be extracted from the SACD image. The SACD image cannot be loaded directly into mpd unfortunately. While both MPlayer and FFmpeg balk at playing an iso file of DSD files it looks like MPlayer, FFplay and SMPlayer will all support playback of DSD files (or groups of files) 'out of the box' once an iso is mounted and individual files can be selected. Not the answer you're looking for? Browse other questions tagged sound software-recommendation hardware or ask your own question. Is there a SOP Cast player available? Is there a music player like Winamp? Focussed working, is there an app for that? Is there a multiboot iso creator for ubuntu? Is there a way in Ubuntu to rip a CD to FLAC and add ReplayGain tags automatically?